Susan studied flute, bassoon and piano at the Birmingham Conservatoire where she was taught by members of the CBSO.She also plays recorder, oboe, clarinet and saxophone. Her main musical interest is in chamber music, she performed with the Rosemary Quartet for 7 years receiving expert tuition from Lady Barbirolli ,Georgina Dubrèe and Janet Craxton. She played principle flute in the New English orchestra and more recently has played for many opera, musical and choral productions. She also plays regularly with her family. With 30+ years teaching under her belt Susan has enjoyed working in many of her local secondary, primary and private schools as well as teaching at Matlock teacher training college (now sadly no more). she has also done some outsourced teaching for Nottingham University. Susan is constantly looking for the easiest, most fun way to help students on their musical journey which makes her teaching particularly suitable for children suffering from learning difficulties.She has successfully taught children with dyslexia, dyspraxia, brain damage and autistic spectrum disorder. 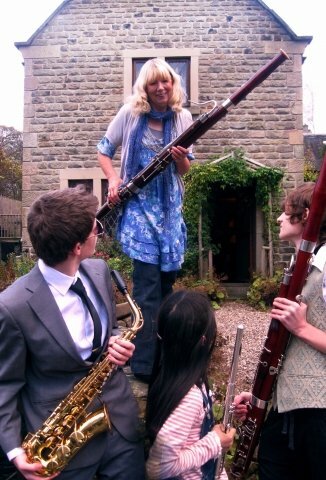 SusanFrom Joanne (5/5): My daughter is once more loving her lessons and the Oboe thanks to finding a good teacher.